The Bold and the Beautiful spoilers for Tuesday, February 12, tease that Florence “Flo” Fulton (Katrina Bowden) will go into panic mode. After being questioned relentlessly by Zoe Buckingham about the adoption papers that Zoe found in Reese Buckingham’s (Wayne Brady) apartment, Flo spilled some details that she shouldn’t have. Specifically, she told Zoe that Reese brokered Steffy Forrester’s (Jacqueline MacInnes Wood) adoption. Now Zoe knows that Reese and Taylor Hayes (Hunter Tylo) arranged for Steffy to adopt the baby now known as Phoebe Forrester (Isabella de Armes and Redford Prindiville), and Zoe knows that Reese wanted to keep his involvement in the adoption a secret. These were details that Reese didn’t want getting out, so Flo is going to be very worried about what she’s done. Flo’s also going to be worried about Zoe potentially digging deeper into the adoption situation. Zoe doesn’t look at all like she’s going to let up until she finds out the whole truth about the adoption, so Flo will decide that she needs to tell Reese what’s going on and get some help to shut Zoe down. Flo will frantically try to get in touch with Reese…that is, if she can. Reese left Los Angeles with the goal of putting distance between himself and Flo, and with the goal of getting away from the baby swap situation, so Flo may have some difficulty reaching Reese. In fact, Flo might fear that Reese may have disappeared for good, with the intention of letting her take the fall if things go bad. 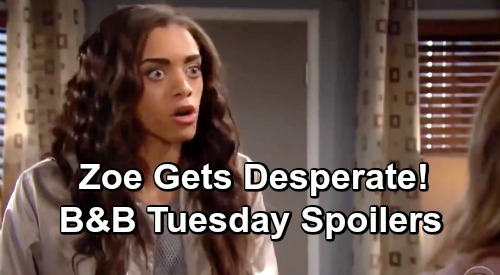 Meanwhile, on the new B&B episode on Tuesday, February 12, Steffy’s concern over Hope Spencer’s (Annika Noelle) attachment to Phoebe will grow. Steffy has watched Hope obsess over Phoebe and she’ll decide that it’s time to voice her concern. She’ll express to Liam Spencer (Scott Clifton) how worried she is about Hope’s state of mind right now. But Liam will defend Hope to Steffy. Liam will probably admit that he’s concerned for Hope, too, but that Hope has a good head on her shoulders and tends to know what she needs. And if Hope thinks that doting on Phoebe helps with her grief, then perhaps they should be understanding and let her do what’s best for her. Of course, that may not be so easy for Steffy to do, considering that Hope is really acting strangely around Phoebe. Steffy was really unnerved when she heard Hope talking to Phoebe over the baby monitor, so she’ll probably keep a watchful eye on Hope going forward. It sounds like a lot of B&B drama is heating up for Tuesday, so stay tuned! We’ll give you updates as B&B news comes in. Stick with the CBS soap and don’t forget to check CDL often for the latest Bold and the Beautiful spoilers, updates, and news.